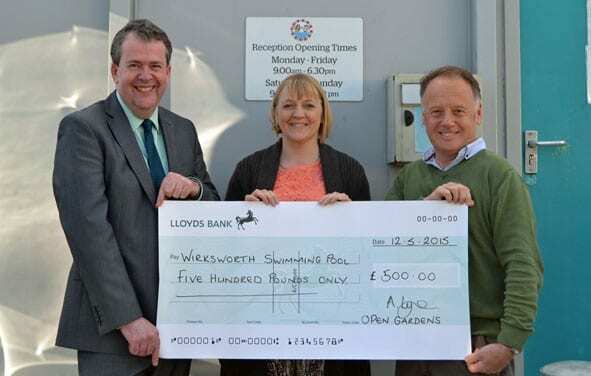 Support for Wirksworth Swimming Pool continues with two new community donations. Andy Lyne from the Hidden Gardens and Courtyards of Wirksworth popped in to Wirksworth Swimming Pool this week with a lovely donation of £500.00. Andy and local residents, Jane Aitman, Peter Riddle, Kirstie Lyne and Les Biggs, host an annual event in the town. Visitors follow a trail around approximately 20 gardens and courtyards viewing intriguing sites that are often hidden from public view. Money raised during the event is gifted to local charities and Wirksworth Swimming Pool is very pleased to be one of those to receive a donation from the last event. In addition to this donation, Wirksworth Swimming Pool has also received money from the Friends of Wirksworth Swimming Pool fundraising group. The group recently held a raffle, tombola and balloon modelling stall at the town’s Farmers’ market. The event was a great success raising a fantastic £1107.80 for the pool. Many local businesses and pool users donated prizes, so thanks go to everyone involved for their support. Fleur Fern, of Wirksworth Swimming Pool comments: “We are lucky, there is such great support in Wirksworth for the pool. We are only a small charity and put every penny donated to good use. When the Hidden gardens team called about their donation the boiler powering our showers had just broken. Their money has helped fund a new boiler, which all our pool users appreciate! As well as everyday projects we also have aspirations to extend the pool building and improve facilities and the money donated by the fundraising team will be split between current and future projects to ensure we invest for the future”. As a self-funding charity, Wirksworth Swimming Pool is always looking for fundraising support and ideas. If you can help, please contact us on 01629 825704.